It's only Monday afternoon and we already have a winner for the WTF and FFS award of the week. Artist Mark McGowan will be re-enacting the shooting of Jean Charles de Menezes this coming Saturday afternoon, at Stockwell station where the original incident took place. It could be seen as a rather confused and distasteful attempt to treat the public's post-traumatic stress disorder, forcing the public to confront the event one more time to gain some kind of control over the event itself and our reactions to it. It could be seen as live protest art, an expression of dismay and discontent at the current inquest. But really, should it be seen at all? It is understandable that some form of catharsis is needed in order for the public to confront and then be released from this sad, bungled shooting. It is doubtful whether a faithful reproduction of what happened, on the site of De Menezes death is in any way useful, or indeed, 'art' - there must be other, more constructive and effective ways to address this. There's also no suggestion from the gallery or the artist that the station will be closed and cleared for this event so it may take place among the unsuspecting public, who will then have to deal with the consequences of the tragedy all over again and without consent. There seems to be a number of gaps in the intentions and merits of this re-enactment, even in the spelling of De Menezes name in the MacGowan's press release. Calling him John does not show a great deal of care and attention applied to the subject of the 'art' work. 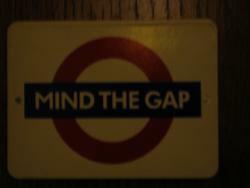 Mind those gaps and stay away: Jean Charles de Menzes needs justice, not a replay of his last unhappy moments.